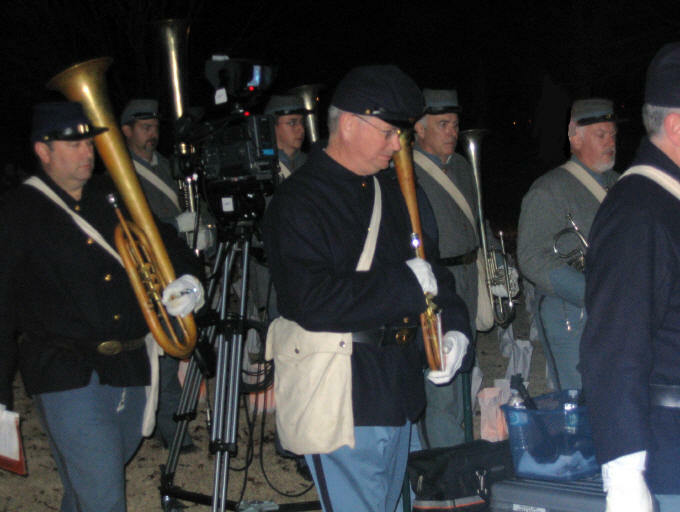 The 2007 Battle of Franklin Commemorative Illumination was held on the 143rd anniversary of the battle at the Eastern Flank Battlefield Park. Beginning at dusk as did the battle, this event was especially moving as the first ever Illumination event on the Franklin battlefield and in view of the McGavock Confederate Cemetery where many of the Confederate dead rest. The event featured 10,000 luminaries representing the casualties of the battle. Olde Towne Brass band performed period songs of both sides including those played by Confederate bands as they advanced across the fields south of Franklin toward the entrenched Union lines. The event concluded with reunification songs signifying the reconciliation of North and South following the War. Afterwards, the public visited brief living history vignettes which portrayed personal experiences during and after the battle. It was a truly memorable experience. Watch our web site for information on next year's event. Or better yet, sign up to volunteer by contacting STFB. Photographs of the preparation and Illumination are shown below. Preparation and placement of the 10,000 luminaries was performed entirely by volunteers. Olde Towne Brass Band of Huntsville AL performed a selection of period songs.